This pretty little barn-roof shed has double doors so you can drive your lawn tractor, ATV or snowmobile right in. Building plans are available here in three different sizes: 12'x16', 16'x20' and 16'x24'. Those are all big enough for this to be your hobby shop or backyard studio too. 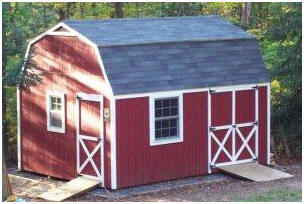 You'll receive a forty page plan set for each of the three different sized mini-barns. The blueprints include truss angle cutting patterns, a material list and all of the details that you'll need to build your own.